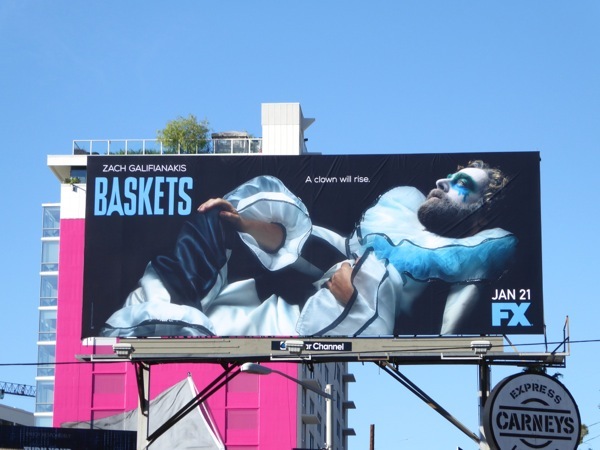 Clowns, you either love them or hate them, they're quite the polarizing circus performer. 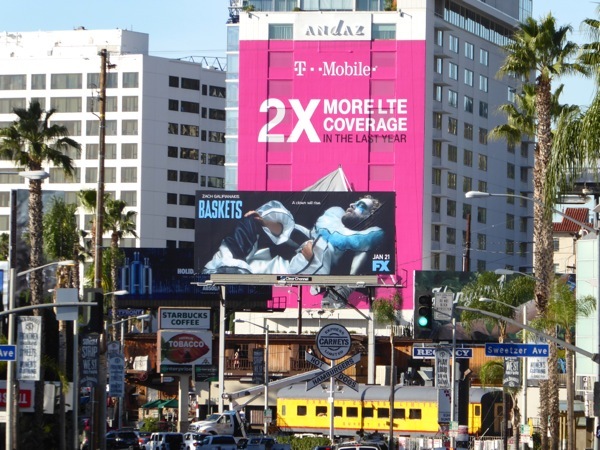 That's probably down to the many horror and slasher movies they've appeared in, from Poltergeist's clown doll to 'Pennywise' from Stephen King's It. 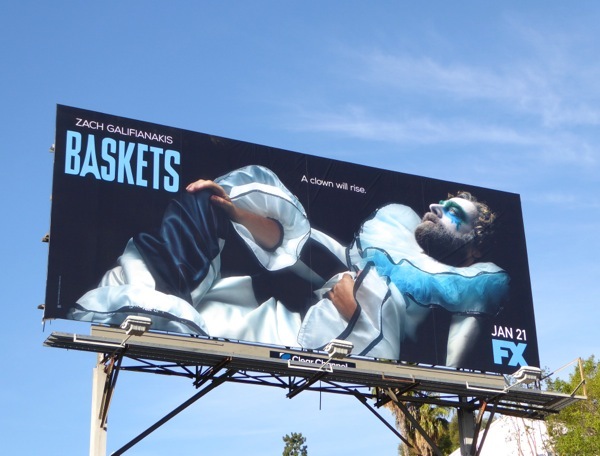 Now FX is sending in the clowns with Zach Galifianakis as 'Chip Baskets', who dreams of being a classically trained French clown in Paris like Pierrot or Marcel Marceau, but his aspirations get downgraded to the life of a Rodeo clown in the new comedy series. 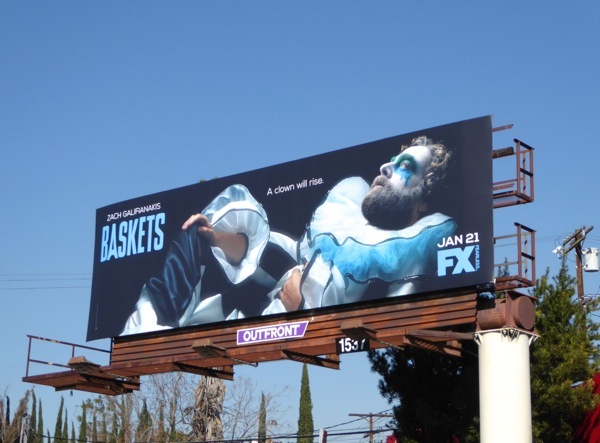 The sad story follows Baskets as he returns to his hometown of Bakersfield with his French wife (who's only in it for the Green Card), reluctantly spends time with his mother (played by stand-up comedian Louie Anderson in drag) and more successful twin brother (also played by Galifianakis), and finds himself under-appreciated by his audience and co-workers. 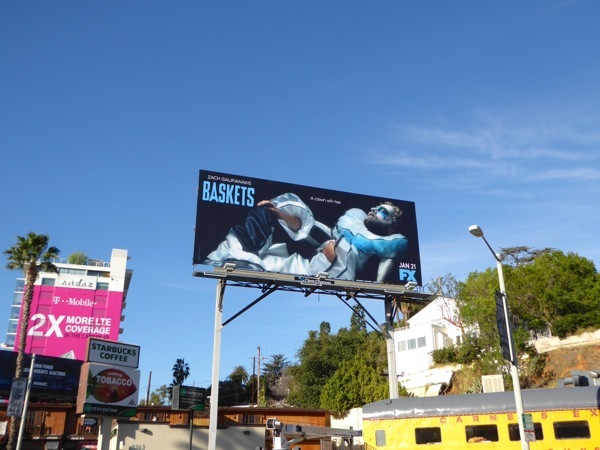 These Baskets series premiere billboards were first spied along West Hollywood's heavily trafficked Sunset Strip on December 16, and later along Melrose Avenue on December 30, 2015. 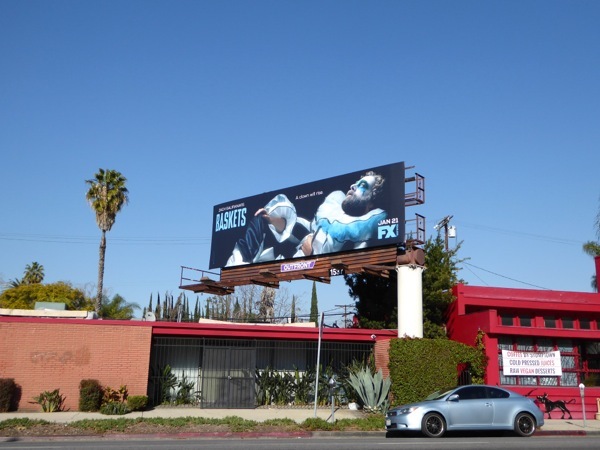 If you're a fan of the funny guy, you can also check out Zach Galifianakis in these fun 3D mannequin billboards for The Campaign movie, these billboards for The Hangover movies, these Bored to Death season three TV billboards and alongside Robert Downey, Jr. in these Due Date film billboards. Can this clown put on a happy face and shine, or does a lifetime of entertaining ungrateful kids at birthday parties await him?